Crecer Leyendo (Grow Up Reading) is a programme aimed to promote a taste for reading in several vulnerable communities in Cartagena and Bolívar. During the last 12 years the Hay Festival and Fundación PLAN have been developing the Hay Festival Comunitario, a festival which tries to promote a taste for art, reading and culture to children and youngsters by bringing national and international writers to communnities such as Pozón, Membrillal, Bayunca, Tierra Baja, Puerto Rey and Boquilla, among others.This process has contributed directly to boys and girls participating in Hay Festival Comunitario´s activities, thus allowing encounters between the youth and writers invited to the Hay Festival. These literary activities are addressed to a child and young audience and take place in several communities in Cartagena and Bolívar where passion and love for reading has awaken in thousands of boys and girls, enabling them to undergo a transformation in their lives and reimagine the world. Hay Festival Cartagena de Indias 2019 offered a programme aimed to university students. Encounters between authors and students was hpld thanks to the support of the existing alliance with Fundación Universidad Los Libertadores..
Acción Cultural Española (AC/E) is a Spanish public body dedicated to promoting Spain’s culture and heritage, inside and outside the country, through an extensive programme of activities. This includes exhibitions, meetings, conferences, film, theatre, music, audio-visual productions and initiatives that boost the mobility of professionals and artists. As part of the promotion of the internationalization and mobility of Spanish literary professionals, AC/E collaborates with the Hay Festivals held around the world, co-organizing activities for the promotion and dissemination abroad of the work of Spanish writers. To accompany the real-world event programmes of the Hispanic festivals, expanding their scope through the use of digital tools, Hay Festival has teamedup with BBC Mundo for the preparation of a supplementary online programme in which Hay Festival Cartagena guests and other major figures in the world of European and American culture talk about current affairs, offer suggestions forbooks to read and authors they admire, and share their views on specific subjects. Readers can also find notes of interest and test their knowledge of literature and the Spanish language. This digital programme, with exclusive online videos, texts, images and conversations, will be broadcast on the website of BBC Mundo and Hay Festival from January 28 onwards. Hay Festival and El País have established a media alliance for all the festivals in Latin America, bringing the festival to the readers of the newspaper, and the interviews and investigations of the newspaper to the spectators of the festival. The newspaper will feature a talk at each festival with a great international personality, and both organizations will share content to bring the Hay Festival closer to the readers of El País. The Hay Festival is part of a European Union network that highlights and celebrates the contribution made by women to the diversity and cultural heritage of Europe, as well as it takes on the issue of gender inequality by supporting women in the market from an intersectional perspective and by promoting a wide range of mobility actions, knowledge, tools, training activities and events. 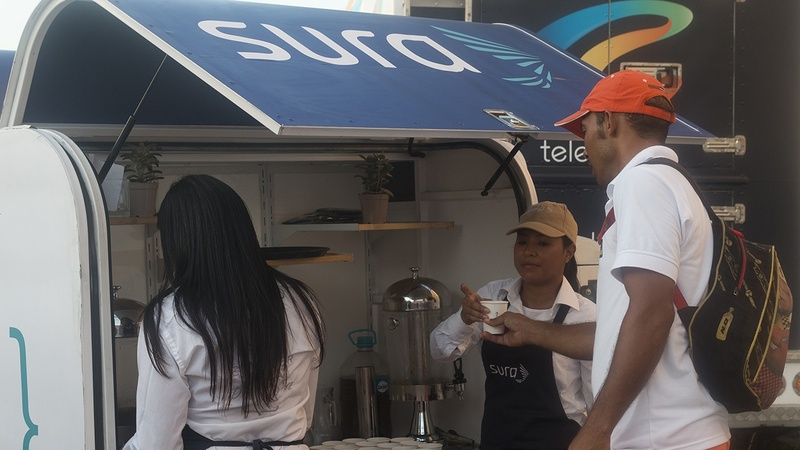 For the second year running, our partner in Latin America, SURA, offered, together with two of the companies of its portfolio, Protección and Bancolombia, a meeting place for all those attending the festival in Cartagena de Indias: The Casa Hay Festival – SURA, Protección and Bancolombia was a place for relaxing, recovering, discovering the arts and starting a conversation with other attendees. The Casa Hay Festival is on calle del Colegio, Casa 1537. You could find a photography exhibition by Jesús Abad Colorado, as well as three reading clubs: Ordesa, with Manuel Vilas, on February 1st, Los Divinos, with Laura Restrepo, on February 2nd and Lectura fácil, with Cristina Morales, on February 3rd. It was essential to have read the books in order to take part in the clubs. Visit their web for signing in and learning about the full programme. The Gabriel García Márquez Foundation for a New Ibero-American Journalism -FNPI- and the Hay Festival Cartagena set up the Michael Jacobs Travel Writing Grant since 2014. During the 2019 edition the fifth winner was announced: Ernesto Picco. Since 2014 FNPI - The Gabriel García Márquez Foundation for a New Ibero-American Journalism and the Hay Festival Cartagena de Indias, as part of an alliance of more than a decade, decidaded to organise, as a tribute to the English writer, the Michael Jacobs Scholarship of travel chronicle, which awards with 7.500 dollars a book or travel article project about Hispanic America or Spain, to be published in Spanish or English. Since 2017, the scolarship is supperted by The Michael Jacobs Foundation for Travel Writing. In four editions, the Grant has received more than 700 travel book proposals, of which 5 winners have been selected: Álex Ayala (Spain), Federico Bianchini (Argentina), Diego Cobo (Spain) Sabrina Duque (Ecuador) and Ernesto Picco (Argentina). Writer, editor and English teacher Dylan Moore from Newport, Wales, has been named recipient of the Cymrawd Rhyngwladol Cymru Greadigol Hay Festival / Hay Festival Creative Wales International Fellowship for 2018-19, a programme in partnership with the Arts Council of Wales that provides an opportunity for a writer from Wales at a significant juncture of their career to participate in Hay Festival editions throughout the year in Wales, Colombia, Spain, Peru and Mexico. The Hay Festival and the British Council launched a global alliance in the 2010 Hay-on-Wye Festival-- deepening their joint work since the birth of the Hay Festival Cartagena- and have since then worked together to bring British writers and thinkers to a larger global audiences. The British Council literary team fosters British editors, poets and writers in different communities and audiences all over the world, developing high-quality and innovative events that create connections between writers, editors and cultural institutions. With over 80 years of experience, the Britsh Council works in more than 100 countries offering exciting opportunities for an international audience to know the vast and vibrant universe of British writing and literature. The British authors of Hay Festival Cartagena were supported by the British Council, institution that inaugurates the celebration of its 80th anniversary in Colombia with its participation in the Hay Festival Cartagena. Banco de la República manages a network of cultural centers, libraries and museums in 29 cities throughout the country for the service of Colombians. As part of its cultural programming guidelines at the national level, the Bank has established an alliance with Hay Festival Cartagena de Indias to bring national and international festival guests to wider audiences through the programming of free meetings, conferences and workshop . Thanks to this alliance, the Hay Festival has reached cities such as Buenaventura, San Andrés, Santa Marta, Manizales, Riohacha, Neiva, Medellín and Bogotá. For the first time, Universidad del Norte and Hay Festival build up an alliance in order to provide students of the city of Barranquilla with programming. In the 2019 edition, Amanda Levete, the renowned British architect, Juan Carlos Méndez Guédez, Spanish-Venezuelan writer, and Deirdre McCloskey, American economist, joined us. These activities took place in the auditorium of the Universidad del Norte on 4 February between 08:30 and 12:30. The Eccles Centre & Hay Festival Writer's Award is an annual award of £20,000 for a current writing project exploring the Americas. Sponsored by the Eccles Centre for American Studies at the British Library, the Writer’s Award is run in partnership with Hay Festival. The award is open to writers working on full-length non-fiction or fiction books, in English or Spanish that require research use of the British Library’s Americas collections. Hay Festival, the not-for-profit event series with editions across the Americas, is pleased to support the award in reaching the widest possible audiences, profiling winners at its festivals around the world. Sarah Churchwell, who won the award in 2015, participated in the Hay Festival Cartagena. The Eccles Centre & Hay Festival Writer's Award 2020 will open in spring 2019. For the first time, Maloka and the Hay Festival came together to present Richard Deverell in Bogotá, director of Kew Gardens (the Royal Botanical Garden of London), where the largest collection of live and dissected plants in the world is located. During his visit, he held a conference called ¿Pueden los jardines botánicos salvar el mundo?, which took place on Wednesday, January 23 at 18:00. in the Maloka museum.